Now accepting reservations for the upcoming Big Game Hunting Seasons! Hunting – The Historic Williams Ranch is a prime location to hunt GMU 501. With the surrounding habitat thriving with many big game species and herds; hunters have an opportunity for a high success rate. What makes Historic Williams Ranch so unique is that the property showcases multiple fresh water and food sources for Elk, Deer, Big Horn Sheep, Moose, Cougar & Waterfowl. If you are looking for a satisfying days hunt and a evening full of luxuries, HWRanch is for you and your hunting party. 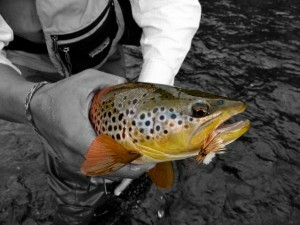 Fly Fishing – Located in the heart of the Historic Williams Ranch, the Tarryall Creek feeds this fertile valley with its high mountain meadows and rugged terrain. With just over two miles of river, this gold medal quality fishery will provide numerous angling opportunities for all anglers alike. Known for its abundance of aquatic insects and prolific dry fly hatches, the fish grow big on the Historic Williams Ranch. Need a Guide? Lodging – The Cabin at the Historic Williams Ranch is currently under renovation to improve the overnight experience for our clients. 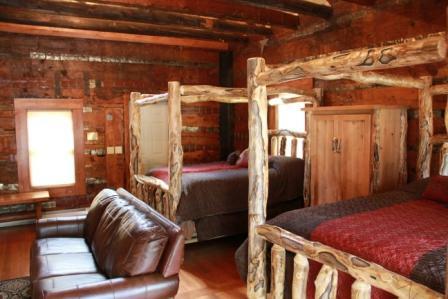 The Cabin sleeps 6 adults comfortably with a master bedroom, full bath, full kitchen, living room, and bunk room. The goal of the renovation was to expand the comfortable living area of the main historic structure and provide modern conveniences. Please see the accommodations of the Cabin.